Share the post "Why you should stop "selling" and become an order taker!" In the next 4 minutes I am going to try to prove to you why salespeople should STOP trying to sell more cars and become order takers instead! Hint: The best salespeople in the country are order takers! Okay salespeople, how does collecting over 250 referrals in one month sound? One of my students learned and applied a technique in mid-January and collected 48 referrals from 12 sales, then collected over 250 referrals in February from 16 sales! You want your mind blown? Read the P.S. statement at the end of this email. This is written for salespeople like my friend Michael who after 14 years of selling cars was tired and stuck and didn’t know what to do. In this post I am going to share with you 3 problems that cause me to believe salespeople should stop trying to “sell” more cars and 2 Solutions to help them become a professional order taker. Then I will share 1 simple call to action that can make a huge difference for your business in March, April, and May. I don’t know about you but taking orders sounds a lot easier than selling. You see it takes time and energy, and time, and effort, and time to persuade someone to do something – did I mention it takes time too? And there’s only so much time and energy a person has – eventually both your time and your energy run out! But it doesn’t take much time or energy to take someone’s order. It’s really easy to do and can be done multiple times a day without stressing either party out. Problem #1 – Most people want to take the path of least resistance and this is not unique to salespeople – this is a human trait, not a salesperson trait, and the path of least resistance is something your customer desires too. Taking short-cuts is not only common but it’s normal. That means if you like to do the easiest possible thing in the shortest possible time, you are a normal person. The goal should be to figure out how to produce the highest possible sales volume in the quickest possible way and in the least stressful manner! Problem #2 – Most people have an aversion (negative reaction) to being “sold”. I think it was sales trainer Jeffrey Gitomer who famously said, “Most people don’t like to be sold – but they love to buy”. In the most stereotypical version a salesperson is someone with an agenda to get someone to buy what they are selling while a customer is someone with a want or need and a healthy degree of skepticism towards a salesperson. This can lead to a potentially adversarial sales process and that’s why it takes sooooo much time to “sell” someone. What this means is that we need to create an environment where more customers are choosing to buy from you so you don’t have to “sell” them – create more customers who want you to take their order. Problem #3 – Selling cars is hard. Selling a lot of cars is really hard and selling a lot of cars every month is so ridiculously hard that I believe no one can do it consistently without burning out! All great salespeople who are top producers are no longer “selling” as much as they used to. At some point in their business, most 30+ car salespeople, make a shift more towards “order taking”. Probably over time and probably (for some of them) without a strategy they began to work with (take an order from) more repeats and referrals. As their business shifted, so did their style of “selling”. They started to see more and more customers coming in to buy that didn’t need to be “sold”. Obviously I know there will always be salesmanship and presentation and objection handling and closing, but no one can deny that there is a huge difference between “selling the fresh up” and “helping the repeat buy”. The easiest and fastest way to 30+ a month and to become an order taker is to decide to work by repeat and referrals. 2. Proactive – Opportunities you get through prospecting and then contacting them – a repeat or referral you call and you schedule to come in so you can help them buy. 1. Stay where you are so customers can find you. DON’T dealer hop! My friend Dan (salesperson of the year for over a decade in a row) gave me this wise advice when I was only 3 months into the business, “The grass looks greener on the other side of the fence, but the water bill is higher too!” Follow Dan’s advice and stay where you are! 2. Perform better than an average salesperson. Obviously, the more out-standing of a sales professional you are the faster your repeat and referral business grows. So always add to your product knowledge, investigative questioning, presentation skills, negotiating, and closing skills until you are the best in your market. 3. Engage your customers at least 6 times a year. Engage in at least 3 of these possible ways: face to face, phone conversations, texts, emails, letters, social media comments, voicemails, newsletters, birthday/greeting cards, or gifts. The more engagement and the higher the quality the faster it happens! Salespeople don’t do these things and that’s why so many struggle to sell 15 and why most don’t easily produce 30+ every month. These 3 multipliers have a compounding effect on how fast your business grows and how fast you can become an order taker who produces 30+ cars a month. Any one of these can get you there in 7-10 years, but it’s the combination that creates the exponential growth and gets you there in 3-7 years. Solution #2 – The Proactive approach to building your business is faster and should be added to the 3 multipliers; Stay, Perform, and Engage. When you add a Proactive business building strategy you will speed up the process considerably and get you to 30+ orders per month in as little as 3 or less years. Asking for and getting a massive number of referrals is the fastest and easiest way to become an order taker to the tune of 30+ sales per month. I said a MASSIVE number so that means you have to get at least a 5:1 ratio of referrals per sale each month. So if you sell 10 cars in March you need to collect 50 referral leads in March as a minimum. THE SECRET?!? – Names and numbers, names and numbers! As proof, I have attached a few examples of MASSIVE amounts names and numbers that each of my students have collected from just one customer! If you like this post, send me an email, and I will share with 5 unique ways you can ask for referrals including my 7 step process. 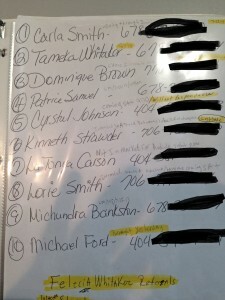 I’ll also share with you exactly how Michael collected over 250 referral leads in one month. 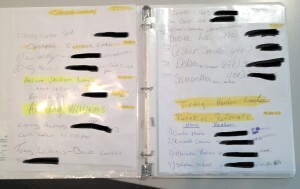 In fact, listen for yourself, how one customer gave him 20 names and numbers and stayed at the dealership an hour and a half after the purchase just to fill out the Referral Request Form and call the referrals for the salesperson and then next month one gave him 40 names and numbers of friends and family. This is called Proactive business building! 1 Call to Action – Here’s what I want you to do… Print off the attached Referral Request Form and start asking for referrals from every customer you sell. The first rule of referrals I teach is to ASK EVERYTIME. So that’s where you start. Use the Referral Request Form as part of your delivery process. Keep in mind that the record is 40 from one customer – that’s 4 sheets! Your minimum average needs to be collecting 5 names and numbers per sale. If you are a 10 car person, you’ll get 5 per, that’s 50 leads. With the proper invitation 10 of the 50 would be open to hearing how you helped a friend or family who recently purchased. 10 interested will result in 5 appointments and 3 sales. You are now a 13 car salesperson who collects 65 referrals (13 x 5) in April. 65 referrals will result in 15 interested, 8 appointments and 5 sales. Now you are at 15! This puts you at 75 referrals (15 x 5) in May. Keep the math going for a year and you can be an order taker by December! Reply to this post by sending me an email and I will show you 5 ways to ask for referrals to increase your ratio to 10:1 and grow your business exponentially! P.S. At Adventure Mazda they don’t payout a bird dog! ZERO! He doesn’t bribe his customers. – CRAZY! That’s why I love psychology, it’s more powerful than money! P.P.S. If you are already using Sellchology University you already know how to use psychology to separate yourself from the competition. Remember to login and watch Chapter 1 of Sellchology University this will remind you how to use the principles of psychology to Create Obligation, practice Give/Get, and use Pattern Interrupt to get Massive Referrals! Just started selling cars. Want every nougat of info I can get! This is a great read! Please tell me more! Hey Jon! Great article! I would love to learn more about asking for referrals, I know that’s the best way to grow my number of car sales and repeat customers. Thanks! Hi Jonathan! I love your youtube videos and your articles! I would love to hear your 5 ways to ask for more referrals! Thanks! On the money as usual! Another tool for the toolbox!! Love it. Order taker is sometimes seen as a negative, love the positive spin! Ready for those referral questions! Very interested in hearing ways to build my business and not being “a slave to the door”! Did not see the Referral Request Form. I need it! I am not getting enough referrals! Love your training, I have started to implement some of the things I have learned, and I am getting good results. I would like to know the five ways to ask for referrals! Great post Jon! Would love more info on how to build a better referral database.